Metals are essential for building the tools necessary for everyday business. Most metals are extremely robust and durable, providing long-lasting strength to structures everywhere in the modern world. Plasma cutting is a process used to cut steel and other metals of different thicknesses using a plasma torch. The process is able to cut accurate shapes in a sheet metal fabrication procedure that is both advanced and used widely throughout the industry. At ControlFab, we can manufacture high-quality stainless steel products using a range of procedures. One of our most popular and technologically advanced procedures is high definition plasma cutting. Whatever product you’re after, we can customise a solution for you with our high precision services. 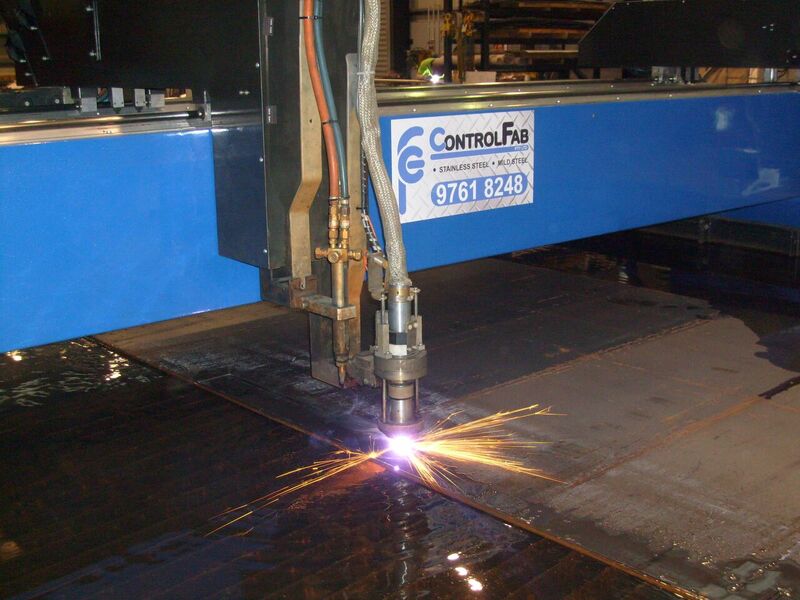 ControlFab offers a high definition plasma cutting service that will cut stainless steel up to 50mm and mild plates up to 64mm thick (oxy cutting of thicker plates). We are able to cut a maximum plate size of 3.6m wide and 9.6m long. Our plasma machine has a built in pin maker to enable us to part number your components as we cut. We are also able to plasma line mark for set up lines or fold lines. Thanks to our small, experienced team, urgent jobs can be done immediately. Contact us online or call ControlFab today on (03) 9761 8248 to learn more about our stainless steel products, sheet metal fabrication, metal cutting, stainless steel fabrication and steel cutting services.